In our race to get ahead, we sometimes fall behind. Fall behind in the important work we can do for others. It is so easy to get caught up in the “day to day,” that real goals can get missed because one is too busy. Keep your eyes open for opportunities which may present themselves to you. Be ready to step outside your comfort zone for something that will bring joy to another and watch the joy then come to you. Many people I meet are nearing retirement or are already retired. This is one of those times when you are able to seize an opportunity. Look for something which will bring you satisfaction while another is being helped. Maybe be so bold as to dedicating the rest of your life to a charity, come on, how many “four putt greens” can you suffer through in the rest of your life? Maybe that in itself is a sign. The Marianist Retreat House in Cape May Point is a perfect place to look for one of those opportunities. Today Brother Al and I did some therapy painting on some tables and chairs on the front porch. 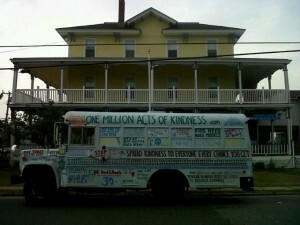 Many wonderful people wandered over to talk about The Kindness Bus parked out front. Some of those same people, shared with me the “opportunity” they have already seized. This entry was posted on Tuesday, June 15th, 2010 at 1:24 pm	and is filed under Kindness. You can follow any responses to this entry through the RSS 2.0 feed. You can leave a response, or trackback from your own site.